Sony today took the wraps off the worldâ€™s first Blu-ray Disc enabled notebook computer-- the VAIOÂ® AR which will be available this summer. Part of a series, the VAIO AR comes in two different configurations: Premium and Standard. The AR Premium version plays Blu-ray Disc high-definition content, so you can enjoy movies in full 1080p HD resolution. The notebook has a17-inch WUXGA (1920 x 1200) widescreen display and uses Sony's XBRITE Hi-Colorâ„¢ LCD technology. For those who prefer to watch content on a larger screen, the AR model also has an HDMIâ„¢ connector and included cable that connects to high-definition televisions for a larger viewing experience. 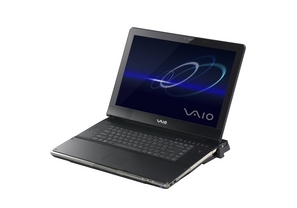 In addition to supporting HD playback, the VAIO AR notebook is a multimedia powerhouse with the capability to record high-definition camcorder content to Blu-ray Discs. Now aspiring moviemakers can shoot, edit and burn their HD creation on a PC -- all in native 1080 resolution. Using an extensive suite of dedicated software applications, you can also edit high-definition footage and share it on Sony high-capacity BD-R and BD-RE Blu-ray Discs (up to 50 GB) or on traditional DVD-R/RW, DVD+R/+RW capitalizing on flexible storage, playback and recording. Luxuriously designed and powerfully equipped, the AR Premium is available in a high gloss, piano-black finish with silver trim and an illuminated VAIO logo. It also has the latest IntelÂ® CentrinoÂ® Duo mobile technology for processor-heavy multi-tasking and high-definition video editing. The VAIO AR series will be available online at www.sonystyle.com and at Sony StyleÂ® stores or select retailers around the country.